How Bowen uses a piece of furniture to get himself down and how he gets me a block to help build a tower. How Bowen uses a person's leg to get himself up. How Bowen uses a person's leg to get himself down & getting me a another block. And just one more for fun... Bowen showing off his knock it down skills with a giant tower we built. One of his favorite games! Bowen has mastered going up and down the stairs in our house on his own! Here is how he gets down the stairs going to our basement. He really wanted to help me with the laundry so he made his way down. He is usually faster than this but he knew I was filming him so he decided to take his own sweet time getting down. Typical! I have decided to do a few video posts the next few weeks just to give everyone a little glimpse of what Bowen is doing... all the things he has accomplished lately! Here is the first one, well three actually. It's language arts day and Bowen is going to show you how well he does with his ABC's, 123's & shapes! It was 3 years ago this week, 10/1/09 to be exact, that I saw this picture for the first time & my life has never been the same. Everything changed the moment I saw this picture. I remember every detail of that day like it was yesterday, just like the days my other two sons were born. I am forever GRATEFUL that God had me "stumble" upon this picture. What a blessing Bowen Aleksandar has been to our family! What a blessing. This a is HUGE step... Bowen has figured out how to use a spoon independently. Bowen loves swimming. I mean he LOVES swimming. He would go every day if he could. We go multiply times a week but that isn't even enough for him. He wants to go everyday. Each day, at some point during the day, I hear "Go swimming?" from him. Even at church, he longs for the pool as his classroom is adjacent to the pool and he can see it through the glass wall. He goes over to that wall and longingly looks at the pool. He has so much fun while he is swimming... his smile doesn't stop from the time we get in, to the time we get out. We usually stay for about 3 hours and even then, he cries when it is time to leave. He has even jumped off the diving board with the Omaha Dive Club a few times recently... just like his big brother! I love that he has so much passion for the sport of swimming! I usually can't get any pictures or videos of him because I am the only one with them. This past weekend however, their daddy was finally able to join us at the pool and I was finally able to get some pictures and videos of all the progress Bowen has made this last year. Yay! I have been working on this skill for several months... basically almost a year now. He started out only being able to stay on his back about 10 seconds before he sank, then 30 seconds... and now, he can do it for minutes at a time! I am so unbelievably proud of him. He is so determined and such a fighter... he can pretty much accomplish anything he sets his mind to! Next step, teaching him to swim to the side of the pool on his back. Jumping in... this is what he & Brooks do over & over & over again at the pool each day. I catch one, then the other, and so on... usually for over 3 hours! They love it! Bowen is getting ready to join the Omaha Dive Club like his big brother! Swimming under water... he loves to do this over & over again. Then holding onto the side all my himself! He is doing so good, I am so proud of him! Holding onto the side, all on his own... now that takes a lot of strength! He has been working hard for months to master this skill. Looking good Bowen, looking good! I just had to add this in because Brooksie is so stinkin' cute! Passed out on the floor after a long day of swimming... so cute! Time to do a little catch up on posts... I'll start with this one. On June 11 Bowen celebrated his third Gotcha Day with us! It is hard to believe that he has been home with us now for two years. These last two years have just flown by and when I look back on all he has accomplished in these last two years... it just brings tears to my eyes. He has experienced so much these last two years and if he hadn't come home to be with his forever family, I simply cannot imagine what his life would be like today. Sometimes I just look in the rear view mirror in the car and look at his precious little face checking out all the scenery. Such a simple thing that all of us experience every day as we are running about but for him... something simple like looking out a car window and just loving the little things in life... that was something that didn't happen for him the first 18 months of his life. 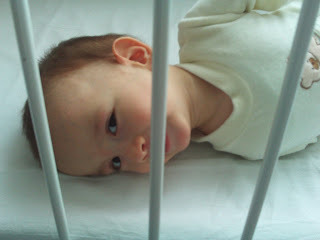 During that time of his life, he laid in his crib all day long and looked out through the slats at his room. Nothing else. So to see his little smile checking out the trucks passing us by, or the people walking on the street, or the signs on the freeway... all those things we see on our everyday errands that mean so little to us... to see him smiling about all of that just brings tears to my eyes. I feel so grateful and so blessed that God brought Bowen to us and allowed us to give him a life outside of that tiny little room in an orphanage in Belgrade, Serbia. God has entrusted us with so much and for that, I feel so blessed. Happy 3rd Gotcha Day Bowen Aleksandar! Life before coming home. Looking through those crib slats day in & day out. Saying DO VIDENJA & CIAO to that orphanage and his previous life. Now safe and sound in the arms of his daddy... checking out all the new scenery! I have always loved this picture of the two of us. One of the best days of my life... finally getting the chance to bring my son home! I look back at this pic of Brooks & Bowen on the day we brought him home... I cannot believe how little and emaciated he looks. What a change two years makes! Heath, who had just turned 4, was so excited when we got back to the apartment with Bowen on that day! From the moment he knew we were adopting, he could not wait for his brother to come home. He has loved his brother so much from day one & for that, we couldn't be prouder! He is such a great big brother. Celebrating his 3rd Gotcha Day... I would say he looks pretty happy!